Turkish Education Ministry Undersecretary Yusuf Tekin on Sunday said they have completed a purge of Gülen movement members and institutions in his ministry, the DHA news agency reported. “The fight against Fetö [a derogatory name used by the Turkish government for the Gülen movement] in the Education Ministry in accordance with a state of emergency declared following July 15 [coup attempt] has been completed. Some 2,500 schools, prep schools and dormitories linked with Fetö have been closed and confiscated and given to the service of the nation. About 30,000 Fetö-linked teachers and staff working for the ministry have been dismissed,” Tekin said during a visit to the Yusufeli district of Artvin province. Tekin also said Gülen movement goals of infiltrating the curriculum and textbooks have been dealt with. Despite the movement strongly denying involvement in the failed coup, Erdoğan launched a witch-hunt targeting the movement following the putsch. A total of 62,895 people were detained in 2017 as part of investigations into the movement, according to Interior Ministry reports. Turkish Interior Minister Süleyman Soylu on Jan. 5 said 48,305 people were jailed in 2017 alone over Gülen movement links. Soylu said on Dec. 12 that 55,665 people have been jailed and 234,419 passports have been revoked as part of investigations into the movement since the failed coup. 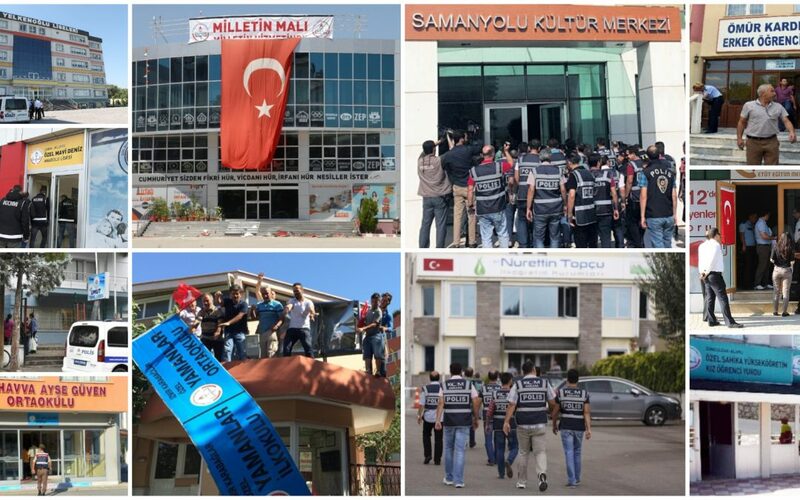 The number of people who have been investigated for alleged ties to the faith-based Gülen movement reached 402,000 in March, the state-run Anadolu news agency reported on March 15. Turkey has suspended or dismissed more than 150,000 judges, teachers, police and other civil servants since July 15, 2016 through government decrees issued as part of an ongoing state of emergency declared after the coup attempt. This article originally appeared in Turkish Minute on March 25.